So you know that feeling when we accidentally spray perfume into your face and you immediately breathe in like an idiot and it’s kind of too much? No? Just me? Okay well this product is like that, but a less intense. The scent is a much lighter than a perfume, so an eau de toilette type, kind of a refresher scent. Which isn’t really, bad just milding annoying to begin with, but after that your face is smelling pre-tty good. 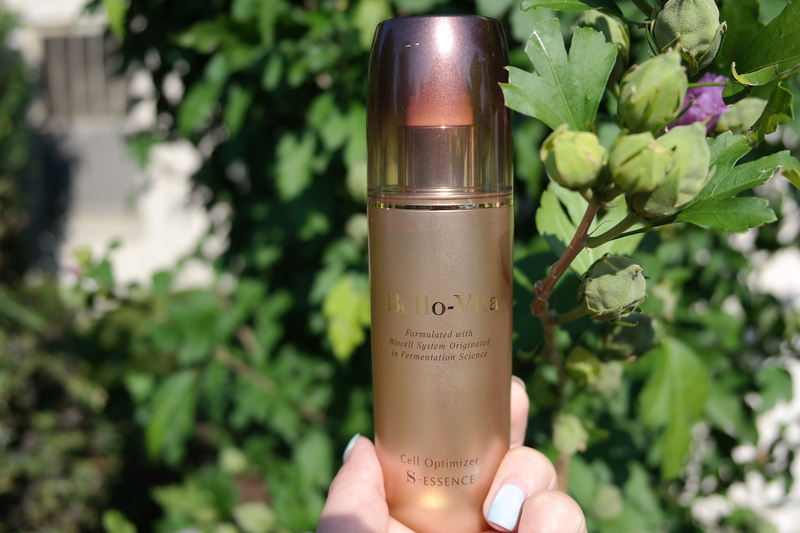 Today I’ll be reviewing Bello-Vita’s Cell Optimizer S-Essence. Like the intro stated one of the flaws of this product is that it’s like an eau de toilette, on your face. But that’s one of it’s good points too at the same time, as your face will be smelling great going to sleep. The essence is suppose to make your face hydrated and leave it feeling supple and silky. The application itself is easy and you just spray and pat. Catching the spray itself on video shows how strong the spritz is. It’s quite a strong and fine mist. You know it’s high quality when the mist action is so fine. However it’s a bit strong so I recommend you spritzing about 6-8inches away from your face, so the density against your skin is less. Less dense, less force, it’s simple physics? The Essence itself looks quite luxurious on the outside and even it’s packaging is a beautiful golden shade. Another cool fact is that the bottle itself has a light opacity so you can see through the bottle to check how much you have left. However, since it’s still summer hydration/moisture on my skin isn’t really a problem so I haven’t been able to notice any changes in my skin after using it for about a week. But my face does smell nice, so I have that going for me. Unfortunately it was my least favorite product in my BNTnews beautybox this time, because everything else was so awesome. I’m giving this a 5/10 on the doris scale. Only because the pumper mechanism is pretty awesome.